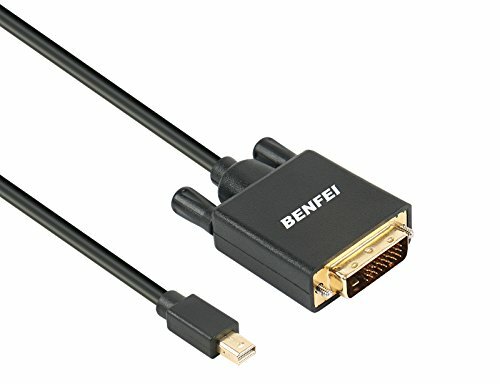 The Benfei DisplayPort to DVI Single Link Adapter - Black is designed for connecting DisplayPort equipped computer systems to DVI equipped monitors, providing optimal video quality up to 1080p HDTV or 1920 x 1200 PC graphics. 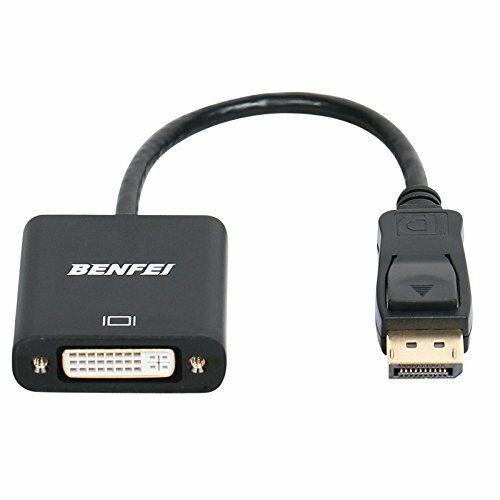 It is a cost-effective solution to allow your DisplayPort computer to work with the DVI display for business, home entertainment, conference rooms, and more. 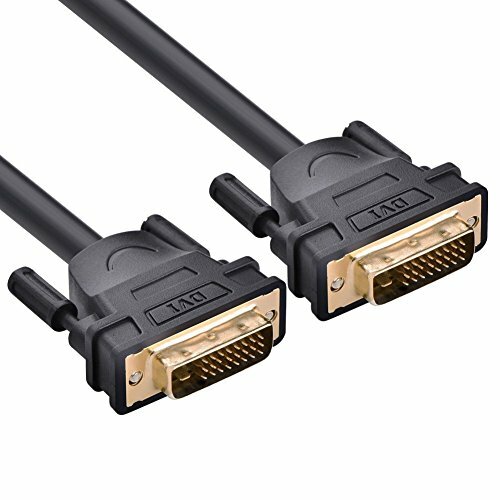 Connectors - Input: Latching 20 pin DisplayPort Male - Output: 24+5(Compatible with 24+1, 18+1,18+5 DVI Cable) pin DVI Female (Note: A separate DVI cable, not included, is required) Specifications - PC resolution supported: 800x600, 1024x768, 1280x768, 1280x800, 1280x960, 1280x1024, 1440x900, 1600x1200, 1680x1050, 1920x1080, 1920x1200 - HDTV resolution supported: 480i, 576i, 480p, 576p, 1080i and 1080p - Chipset: PS8121 - Bandwidth: Up to 2.25 Gbps Compatible Devices - Desktops and laptops with an available DisplayPort output What's in the Package - DisplayPort to DVI Adapter - Black Warranty. Amazon's 30 days money back proteciton and 18-month product warranty. The DVI-I 24+5 to VGA adapter, NOT DVI-D to VGA, please ensure your devices are compatible with DVI-I 24+5 interface before purchasing. 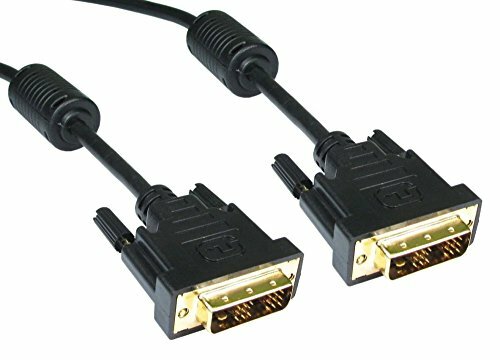 DVI-I 24+5 Male to VGA Female ennables you to connect a DVI-I 24+5 port eqipped desktop, laptop, video card to a VGA equipped HDTV, monitor, projector or projector, and support resolution up to 1080P. 1080P (Full HD) Video Adapter: This DVI VGA adapter supports resolution up to 1080P @60Hz. So you can enjoy HD video or image on the computer monitor, HDTV or big-screen projector. 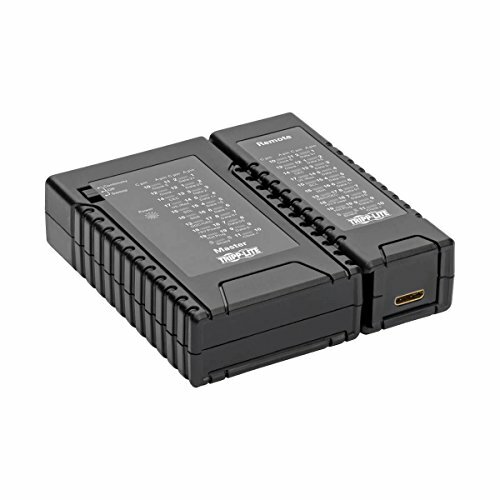 Stable Signal Transmission: Slim DVI & VGA connectors with screws not only support secure connection, but also easy plugging & unplugging, Gold-plated connectors to optimize its performance and protect your devices from EMI and lossless signal between devices. 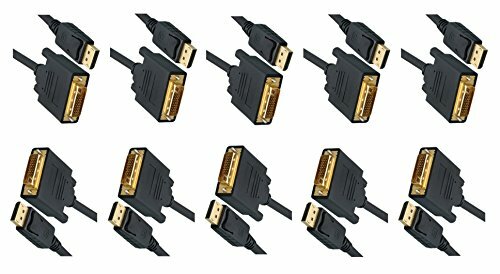 Wide Compatibility: This adapter compatible with all DVI-I 24+5 equipped laptops, desktops, video cards; and compatible with all VGA equipped Flat Panel Displays, Digital CRT Displays, monitors, TVs, projectors and displays. Compact, Portable and Easy to Use: Quick and easy installation. No settings and no software required. Lifetime Warranty: One year warranty for this DVI-I 24+5 to VGA converter. In-time Customer Service always at your disposal. UGREEN DVI-D 24+1 Dual Link Male to Male Digital Video Cable offers you a convenient way to connect your DVI-equipped computer or other source devices to flat panel displays, digital CRT displays, projectors, and HDTV with DVI-D Dual Link interface for video, gaming, conference or home theater. The slim DVI connectors with screws not only support secure connection, but also easy plugging & unplugging. 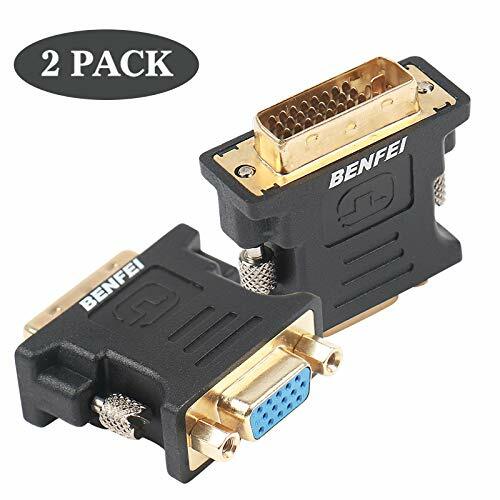 With Triple shielding, ferrite core and gold-plated DVI-D connectors to optimize its performance and minimize cross talk, ensuring high-speed, error-free. Plug-and-Play - No driver or software installation required ! (Suit for DELL,HP,Lenovo Chromebox... Etc).
. Cable Length: 6 Feet , approximate 1.83 Meters. UNIQUE MOLDED DisplayPort Male plug with latch, provides a solid and secure connection, very durable & Reliable. Ideal for video streaming, gaming, or extending a workstation. 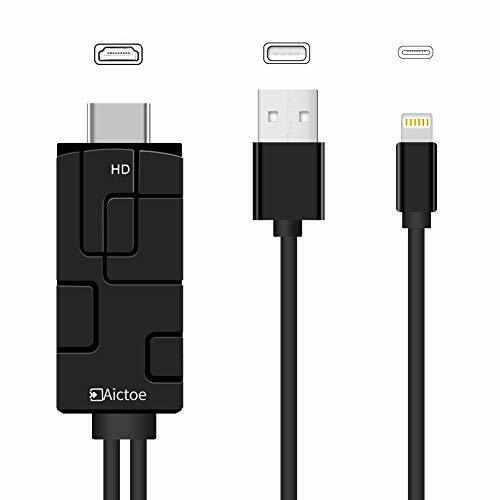 Simple designs and easy to use , DisplayPort 1.2 cable, directly connecting a DisplayPort source device to a monitor or projector with DisplayPort. It also supports DP, DP++ and DisplayPort++ . Gold-plated connectors, bare copper conductors, and foil & braid shielding combine together to provide both superior cable performance and reliable connectivity. Gold-plated connectors resist corrosion, provide durability, and improve the signal transmission; Foil & braid shielding reduces Electromagnetic interference; Bare copper conductor enhances cable performance. What You'll Get: 1x 6 feet DisplayPort Cord, and CableCreation Life Time Warranty. Overview: Digital Visual Interface (DVI) is the standard interface for a high-performance connection between PCs and flat panel displays, digital CRT displays, projectors, and HDTV. DVI-D Digital Cables from Cables & ETC, LLC deliver the high-performance, high-bandwidth interface needed for video displays of today while leaving headroom for the products of tomorrow. These precision-engineered cables are fully compliant with the DVI standard defined by DDWG (Digital Display Working Group). The DVD-D dual link configuration provides enough bandwidth for resolutions up to 2048 x 1536 and allows high speed digital transmission up to 9.9 Gbps. 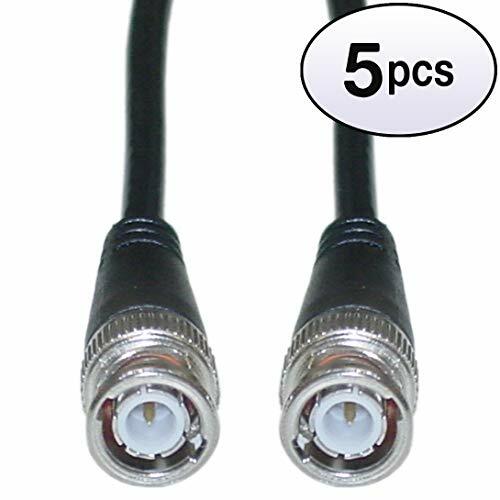 Specifications: Connectors: DVI-D Dual-Link 24-pin Male to DVI-D Dual Link 24-pin Male Dual link digital signaling allows for high speed transmission up to 9.9 Gbps Shielded undermold protects against unwanted EMI/RFI interference 28AWG copper conductors are individually insulated in foam-polypropylene to minimize cross talk, ensuring high-speed, error-free transmission Tri-shielded with dual Mylar foil and braid shield reduces interference Gold-plated contacts provide full conductivity with no data loss Supports hot plugging of DVI display devices PC and Mac compatible Supports digital signal only Compatible with Flat Panel Displays, Digital CRT Displays, Projectors, and HDTV Meets DVI DDWG Standard PC99 color-coded: white Cables & Etc,LLC is the owner of the trademark C&E. This UPC is trademarked under C&E. Any violation will be reported to Amazon without any prior warning. 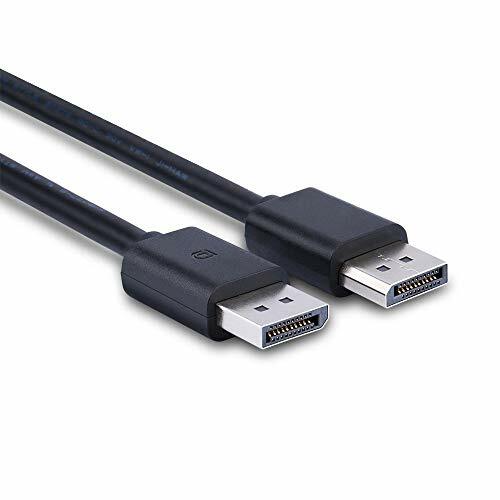 Overview: This 3 foot Displayport to DVI cable from CableWholesale will allow you to connect a DisplayPort compatible device (PC/Laptop) to a monitor with DVI input. Perfect for when your display uses DVI yet your computer or laptop only has DisplayPort. 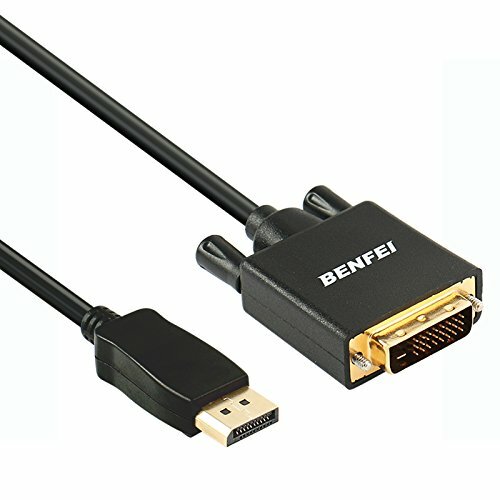 Physically different from HDMI, Displayport is typically found only on computers as a video output. 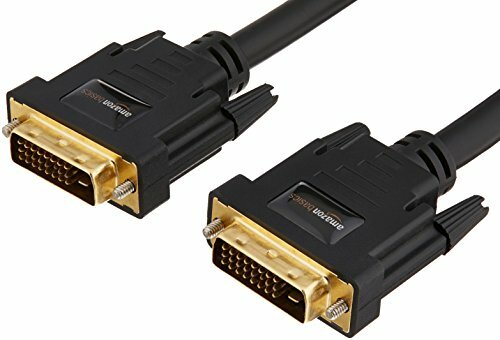 This cable is unidirectional from computer Display Port to DVI monitor. 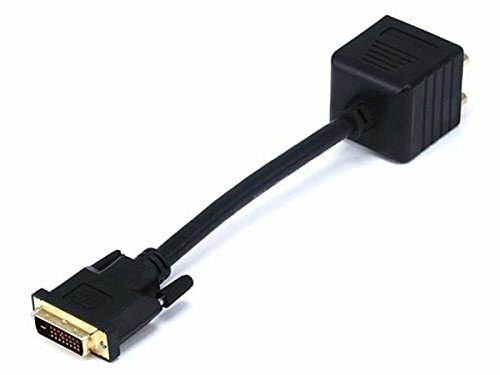 It will NOT provide any signal from a computer with DVI to a monitor with Displayport.. 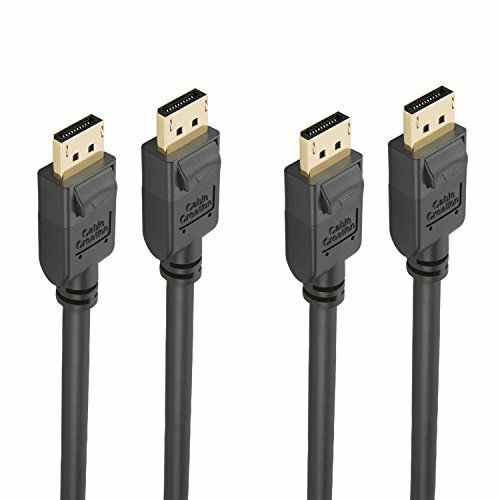 Specifications: This cable is unidirectional from computer Display Port to DVI monitor. 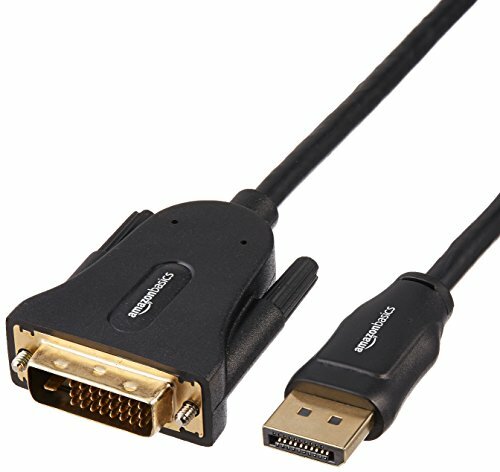 It will NOT provide any signal from a computer with DVI to a monitor with Displayport. NOTE: This cable does not support audio. 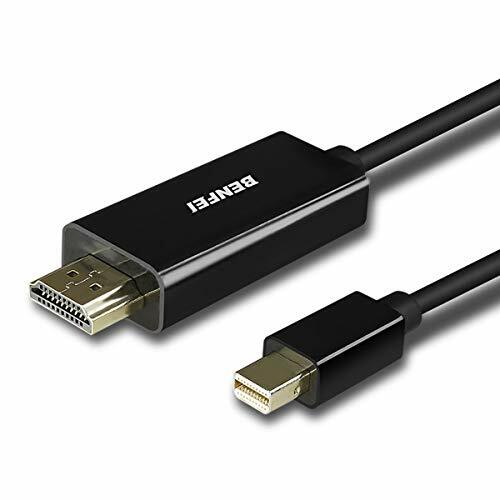 Easily connect a DisplayPort-equipped desktop or laptop to an HD monitor or projector with DisplayPort input using this AllChinaFiber DisplayPort to DisplayPort Cable. 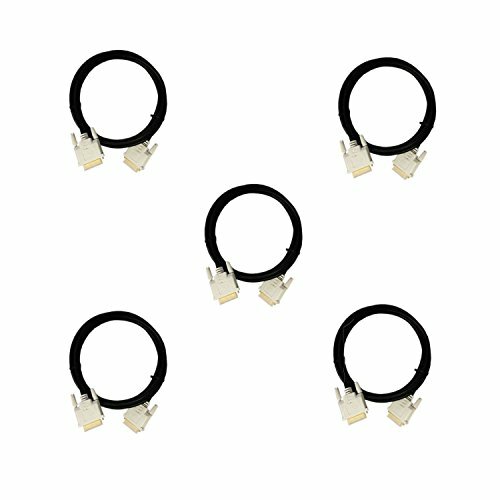 DisplayPort Male to DisplayPort male connection cable. Cable Length: 10 Feet , 3 Meters. HDMI Signal Tester: An Essential Tool for A/V Cable Installers Avoid the problems and costly troubleshooting caused by a bad HDMI cable. This HDMI tester allows you to quickly and accurately verify HDMI and Mini HDMI cables with Type A-A, A-C or C-C connectors before installing them behind walls and in other tough-to-reach places. It's recommended for installers of digital signage applications and home theater systems who need to verify straight or crossed connections and open or short circuits. Features 2 Adjustable Test Modes: Continuity and Sweep Quickly validating whether a faulty HDMI cable is the issue in a malfunctioning application can save you time, trouble and money, as can detecting a faulty cable before you install it. The T040-001-HDMI flips from sync testing (Continuity) to step-by-step testing (Sweep) at the touch of a switch. It displays a 19 pin-to-pin wire map and shield connection status to ensure mapping continuity and proper configuration. The HDMI tester is compatible with HDMI versions 1.0 through 2.1 and cable lengths up to 164 feet (50 meters).Easy to Store in Your Toolbox and Take to the Job Site This HDMI signal tester consists of a main tester unit and a removable remote identifier that are secured in a protective carrying case when not in use. The tester units are powered by a standard 9-volt battery (not included). To test a cable that has already been installed, separate the two units and connect them to each end of the cable. One-Year Warranty The T040-001-HDMI is backed by a one-year warranty, ensuring reliability and performance. HDMI CABLE TESTER: HDMI signal tester quickly detects short circuits and crossed connections in HDMI and Mini HDMI cables up to 164 ft. Locate a faulty HDMI or Mini HDMI cable in an installation. ADJUSTABLE TEST MODES - CONTINUITY AND SWEEP: The T040-001-HDMI flips from sync testing (Continuity) to step-by-step testing (Sweep) at the touch of a switch. It displays a 19 pin-to-pin wire map and shield connection status to ensure mapping continuity and proper configuration. WIDE COMPATIBILITY: The HDMI tester is compatible with HDMI versions 1.0 through 2.1 and cable lengths up to 164 feet (50 meters). PROTECTIVE CASE: Protective carrying case fits in toolbox for use at cable installation sites. Also known as: mini hdmi testing / cable tester / hdmi cable tester / hdmi signal tester / hdmi tester / hdmi wire tester / multi tester cable. 1-YEAR WARRANTY & FREE TECH SUPPORT: Our Chicago-based Tech Support Team is ready to assist you with any trouble-shooting techniques, configuration help, or warranty assistance. Call them at 773-869-1234 M-F 8am-6pm CST. 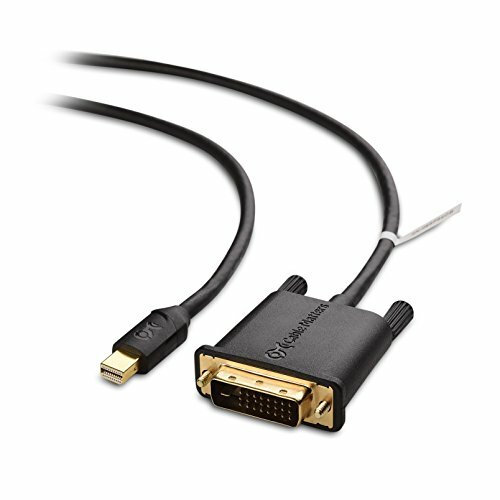 Overview: The DVI cable is the ultimate link for connecting your computer to the latest generation of 4K monitors or projectors with DVI input. By interfacing two digital signals directly, you'll experience faster, higher-quality images. Feature: - Supports resolutions up to 1920x1200 and 1080p (Full HD). - Easy installation with thumbscrews.